The recent release of The SMiLE Sessions must mark the ebb tide of the steady stream of retrospective issues of mythical “lost” albums from the sixties. 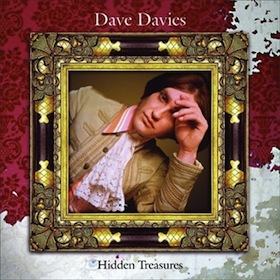 One other such offering that crept out with much less fanfare in the same month as SMiLE is the “lost” solo album by Dave Davies, purveyor of revolutionary guitar licks and falsetto vocal harmonies to the Kinks. Despite its enticing title, as with SMiLE the majority of Hidden Treasures songs have been in the public domain in one form or another for some time, but again like SMiLE the new release represents the first legitimate attempt to bring it together as nearly as possible in its originally-intended form. Played “Do You Wish To Be A Man” on my radio show. Just so good. Anyone think they’re going to shell out for the 60’s Kinks mono boxset? so good to have clean copies of these songs finally. well done. Totally forgot all about this too. Amazing. What a cool time for reissues.